scientists are currently in the development stages of what promises to be the world’s largest wind turbine. As if creating the biggest wind turbine in the world was not enough, it also floats. Current plans for the world’s largest wind turbine have the machine standing 533 feet tall.The proposed rotor diameter of this machine is 475 feet. Obviously, these gargantuan dimensions make it difficult to imagine many places able to accommodate such a device. 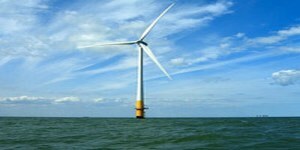 Fortunately, the floating design makes the turbine suitable for open ocean use. In addition to being the world’s largest wind turbine, the proposed machine (which is to be built by the Norwegian company Sway), will also be the most powerful. A single floating turbine will be able to generate 10-megawatts to power more than 2,000 homes. These figures make this proposed new design at least three times more powerful than the existing wind turbines in use today. The floating design gives this generator a huge advantage over other wind-power generators because the device can be placed in deeper water. The machine’s tower is a floating pole filled with ballast beneath the ocean’s surface. This gives the world’s largest wind turbine a low center of gravity, which prevents tipping. The generator is anchored to the sea floor with a single pipe and a suction anchor. This design allows the turbine to tilt 5-8 degrees as well as rotate freely to generate power from any wind direction. Sway plans on installing the device in 2011. The prototype of this machine will cost an estimated $67.5 million dollars. Sway plans on testing the design on land first in Oeygarden, Southwestern Norway. If the design is successful, Sway will continue testing seafaring prototypes. Currently, Norway is one of the world’s top oil and gas producers. Despite this fact, Norway generates most of its own power from hydroelectric plants. Norway’s dedication to designing and building the world’s largest wind turbine showcases the countries commitment to alternative energy, and serves to further illustrate how important this cause actually is. If the world’s largest wind turbine is a success, it will mark a major stride in humanity’s quest to reduce its dependence on fossil fuels.